The amorphous calcium phosphate (ACP) technology is an unstabilized calcium and phosphate system that has been developed and commercialized as Enamelon. It is based on unstabilized amorphous calcium phosphate, where a calcium salt and a phosphate salt are delivered separately intra-orally or delivered in a product with a low water activity (Tung & Eichmiller, 2004). As the salts mix with saliva, they dissolve, releasing calcium and phosphate ions. The mixing of calcium ions with phosphate ions to produce an ion activity product for amorphous calcium phosphate that exceeds its solubility product results in the immediate precipitation of ACP or, in the presence of fluoride ions, amorphous calcium fluoride phosphate (ACFP). In the intra-oral environment, these phases (ACP and ACFP) are potentially very unstable and may rapidly transform into a more thermodynamically stable, crystalline phase (hydroxyapatite and fluorhydroxyapatite). However, before phase transformation, calcium and phosphate ions should be transiently bioavailable to promote enamel subsurface lesion remineralization. 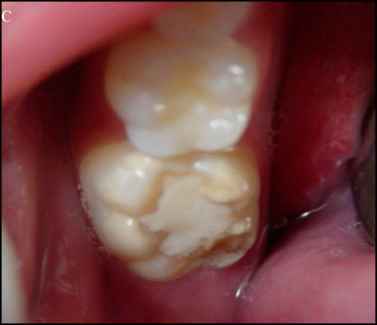 Published papers suggest that the unstabilized ACP/ ACFP technology may have efficacy in preventing caries progression. The unstabilized ACP/ ACFP may transform to poorly soluble phases in the mouth, and, in so doing, may act to promote dental calculus. The formation of fluoride-containing apatite intra-orally would sequester available fluoride ions, thereby reducing their ability to promote remineralization of subsurface enamel lesions. It is likely, though, that some of the ACP/ACFP phases that are produced intra-orally may be stabilized by the phosphoproteins in saliva, pellicle, and plaque that are not at full stabilization capacity. This may explain the bioavailability of these technologies in the presence of saliva and the positive in situ model results (Reynolds, 2008). However, long-term randomized controlled caries clinical trials of the unstabilized ACP/ACFP technologies need to be conducted to demonstrate efficacy in preventing caries and safety by the lack of dental calculus promotion with long-term use.